The functions included are polynomial, rational, radical, trigonometric, inverse trigonometric, exponential, and logarithmic (common and composite functions). The problems covers all the basic derivative rules, including power rule, product and quotient rules and chain rule. Activity Directions: Students work through 15 problems. All the answers are written on 15 of 18 turkeys on a given picture. Every time students arrive at a correct answer, they will “get the turkey” having this answer written on it. 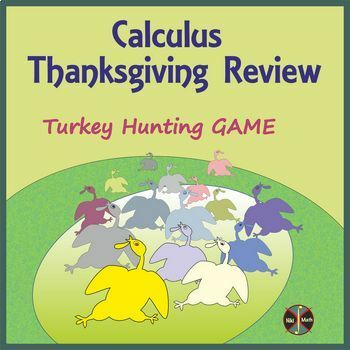 Students are asked to find three happy turkeys who can NOT be caught. The product can be possibly used as a partner or a group activity (group of 3). Student recording sheets and the answer key are provided. I wish you very happy and blessed Thanksgiving! AP Calculus 1 & 2 BIG Growing BUNDLE - Limits, Derivatives, Integrals, Differential Equations, Series (over 1000 problems) - 56 products are discounted at 32% !